100 students quietly jot down notes as they listen to their professor droll on in HCB. The clock slows down and this hour and 15-minute lecture stretches into an eternity. 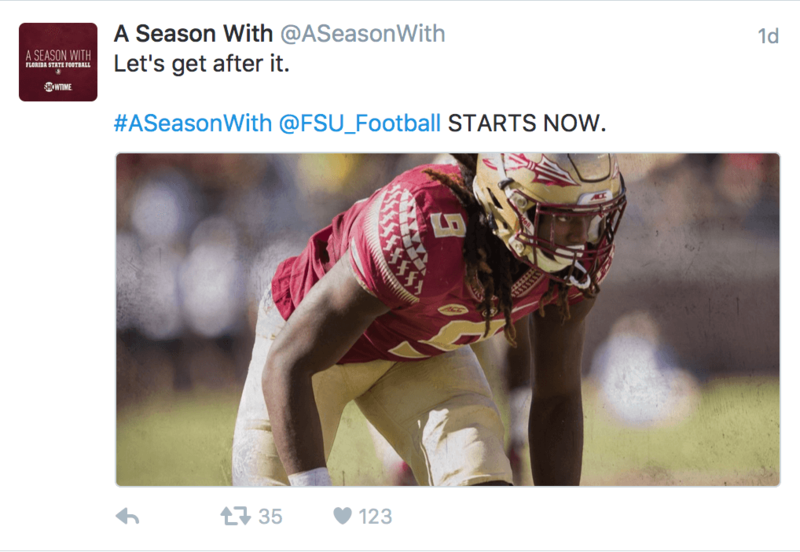 The lucky few who have computers pass the time by strolling through their Twitter account, watching videos of dogs eating marshmallows and highlights from last week’s Florida State University football game, until they reach the end of their twitter stream. This void settles within them, yearning for more tweets. If you find yourself stuck in this bottomless pit of boredom and want new accounts to follow, then hit the “follow” button on these twitter accounts ASAP. Without a TV in your dorm or apartment, you get your news through Twitter. Follow @TDOnline to stay in the loop of global and local Tallahassee news. For over 100 years, the Tallahassee Democrat has been supplying local Tallahassee folk with their news day after day. If you don’t have time (or quarters) to grab a physical copy, don’t fret; they link all their stories to their Twitter account. Now your walk back to Degraff with Rising Roll in hand won’t be as boring. “There’s never a dull story on the Tallahassee Democrat’s timeline. There’s always a great read there, especially when the power goes out during a hurricane and need something to help pass the time. I’m looking at you, Hurricane Matthew,” said FSU junior Catherine Fredrick. 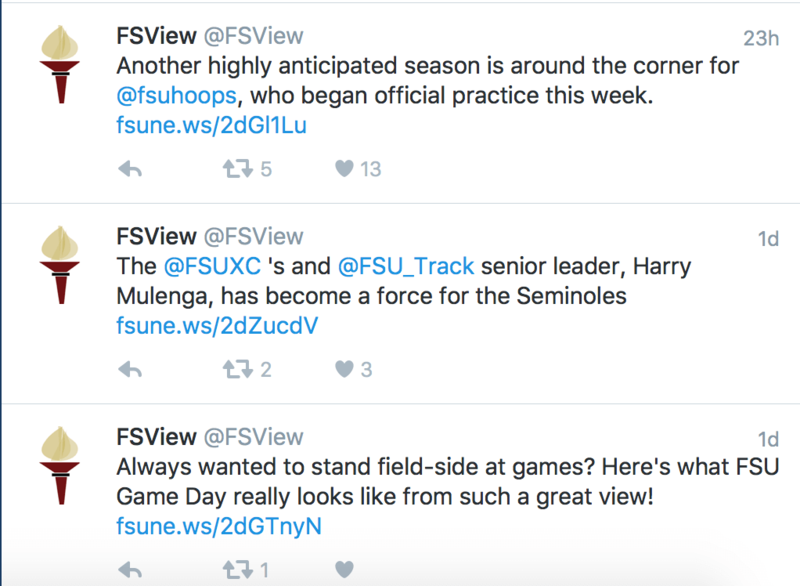 If you want to keep up with all things FSU, follow @FSUView. This publication covers everything from the heart wrenching loss against Louisville to informing us that Lil Wayne will perform at the Civic Center the day before we play Clemson. “Through Twitter, we hope to not only just give people the opportunity to see what we’re creating, but we hope to be a part of the student conversation surrounding Florida State and Tallahassee that occurs on it. We schedule and promote articles, photo galleries and videos on it just as we do Facebook, but Twitter offers more of a chance for us to interact and actually see what the student body is saying, not random Facebook parents,” said FSView. If you aren’t following the @FSUView, you probably just found out that Hurricane Hermine knocked the power out in your apartment. C’mon, man, if you don’t follow your own school on Twitter then just delete your Twitter. 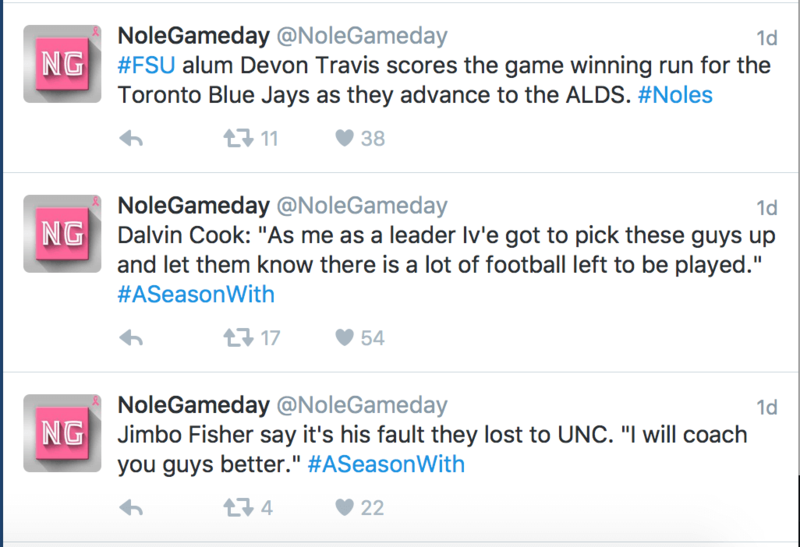 The Florida State twitter account gives you an inside look of the Seminole student body. “It gives this weird sense of pride every day seeing what everyone is doing and what’s going on every day,” said FSU junior Tyler Dacey. The account shows off the amazing and awe-inspiring student body, posting stories of how Noles change the world one day at a time. 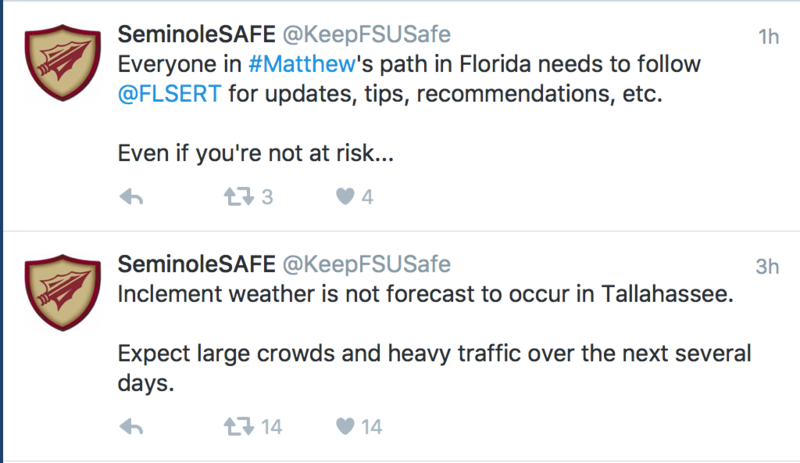 If you despise the FSU emails informing you of a flood warning 30 minutes after you were forced to sprint across campus in the rain, then you should be following @KeepFSUSafe. This Twitter account constantly updates their account with updates on weather conditions, hazards out in the wilderness of Tennessee Street, as well as tips to prepare yourself for when, say a hurricane, comes through and wipes out your power for a week. “From preparedness tips to situational awareness to real-time play-by-play updates during emergencies, our social media accounts and mobile app work in concert with @FSUAlert to keep you informed. An informed campus is a safer campus,” said @KeepFSUSafe. 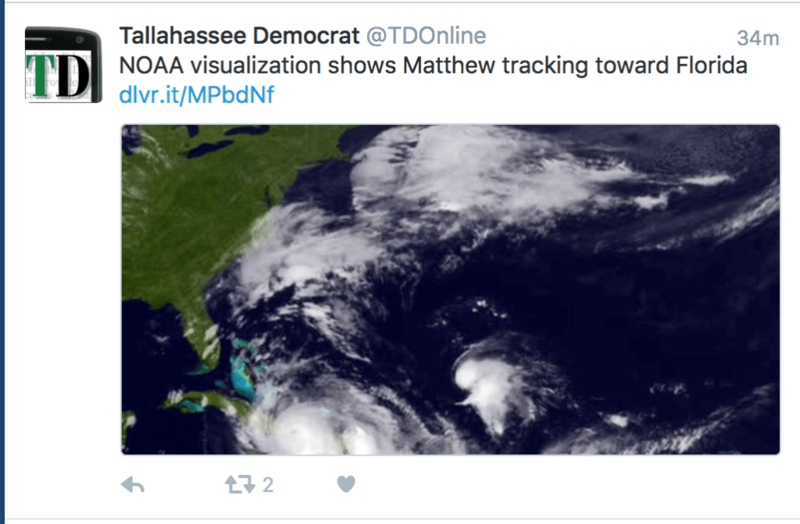 Bet you wished you were following this account before Hermine came and washed away Tallahassee. Searching for the best drink deals this weekend? Need to know when Moes offers free queso? Want to keep up-to-date on the concert you couldn’t go to because you have a project that’s due tomorrow? If you answered “yes” to any of these questions, then you have to shoot @FSU_PartyTutor a follow ASAP. 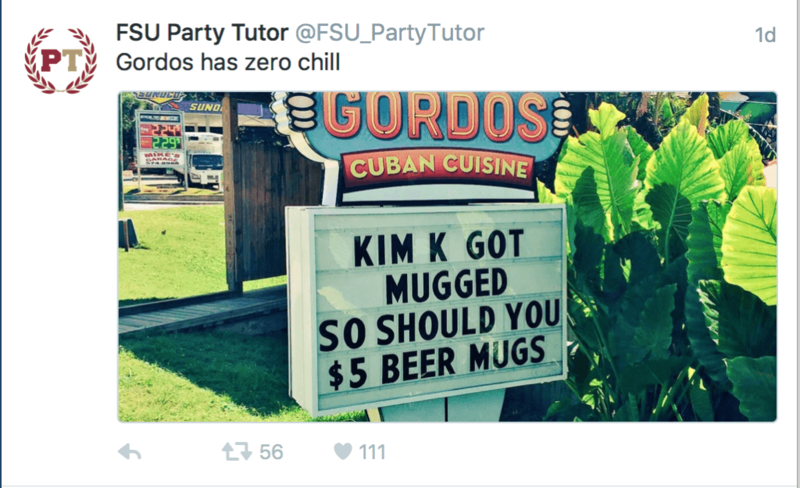 FSU Party Tutor will always keep you in the loop in regards to any and every bar in Tallahassee…or whenever a restaurant even whispers the word “free.” “If you’re not following them, you’re missing out big time on buy one get one pizza,” said FSU senior James Rosenbloom. In case you haven’t noticed, FSU students love their Seminole sports. No matter if you’re in the third floor bathroom of Strozier or studying abroad in London, @NoleGameday will keep you up to date at all times with score updates, play by plays and breaking news regarding FSU athletics. Don’t be sad that you didn’t get a ticket to the game, for @NoleGameday will make you feel like you’re standing on the benches inside the great castle of Doak. Seriously though, why would you ever wait to get a ticket to a football game. What were you thinking? 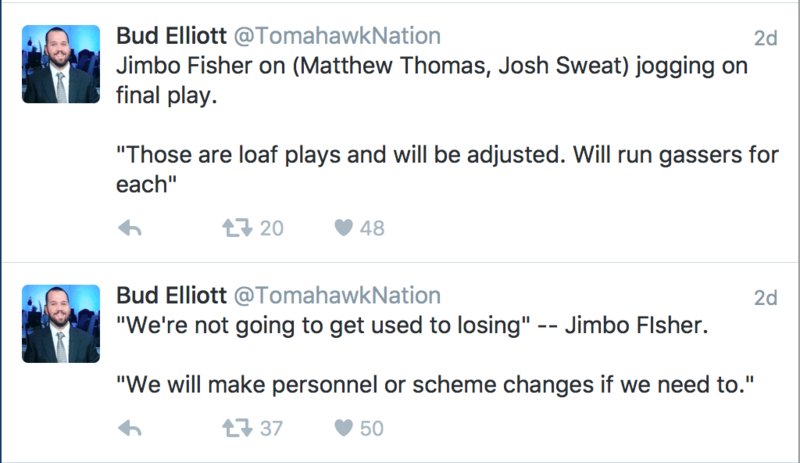 Bud Elliot, the publisher of TomahawkNation.com, runs the Tomahawk Nation twitter account. It keeps everyone updated on the ups and downs with our FSU football team. Every practice, every game, every Jimbo press talk, Bud keeps us in the know. Bud goes above and beyond the final whistle of the fourth quarter, keeping us up to date on anything going on and off the field, especially if it involves Dalvin Cook. He offers his personal analysis of what happens between players and every game. No surprise here why why every Nole should follow this account. A Season With on Showtime showcases a new college team every season. It follows them every single week, giving us an insight to how these teams work, think and feel. Coincidentally, this season they’re following the Florida State Seminoles. Prepare to scream the war chant for no reason while simultaneously blaming your allergies for the tears running down your face as you watch Travis Rudolph eat lunch with Bo Paske. Recaps of heartbreaking losses break your heart in two, making you wonder if you should even watch (PSA: you should). Nothing wrong with a little self-promo, right? If Lil B the Based God, RiFF RaFF and Fiji Water follow me, you should as well. 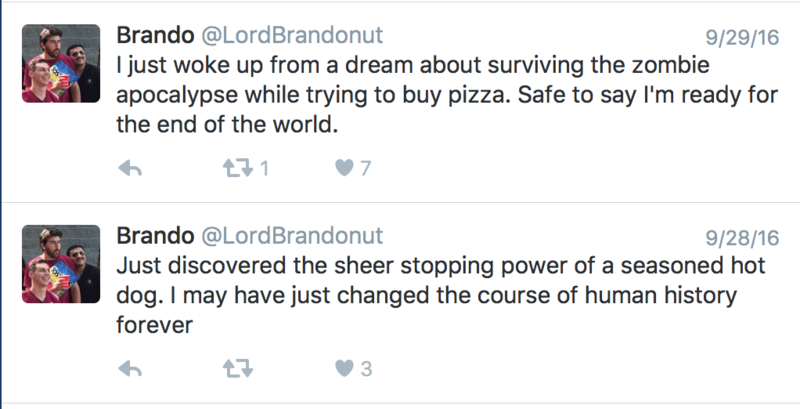 I’m a self-proclaimed Twitter veteran, losing myself in the twitter-verse as far back as I can remember. I’ve experienced every update, every meme and every live event that has ever touched my timeline. I’m always yelling through caps lock about my favorite new albums and actively participating in the #FSUTwitter football family, constantly complaining about whatever goes on in Defensive Coordinator Charles Kelly’s head. If you’re looking for mindless jokes, short innuendos about life and commentary on what’s going on around FSU, then follow me. Brandon is a Junior at Florida State University studying Editing, Writing and Media. He can be found raving about his fantasy football team that came in second place last season or eating something chicken related.